Without a kitchen (still!) cooking has not been happening. It's been take-away far to often, and the urge to eat healthy is kicking in. My aim these next few weeks is to challenge myself to eat healthy without 'cooking' so to speak. Seeing I have no oven or stove, and only a microwave it should be interesting. Salads are always a good thing, just need to figure out how to get the extra protein and carbohydrates without only eating veges and cous cous. Yesterday I made a variation to my Roast Pumpkin and Rocket Salad for a picnic. 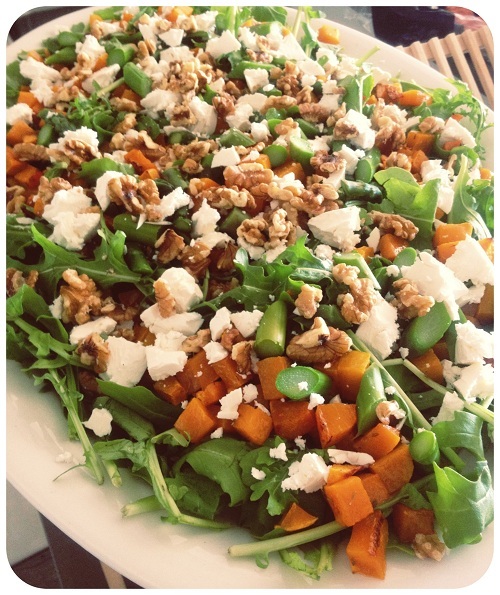 Using my other half's oven, I roasted the pumpkin the same, added rocket, feta, blanched asparagus and walnuts. I finished the salad off with this Basil and Yoghurt Salad Dressing. It was delicious! oh yum. need to make and eat.